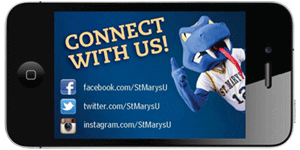 This is the place to find every social media account officially recognized by St. Mary’s University. Your organization must be affiliated with St. Mary’s in order to be included. University Communications reserves the right to determine whether pages are affiliated. To add an account, please review the Social Media Policy and submit a request form on Gateway. In addition to the accounts below, the University has a Kaltura account which provides access to videos and live streaming.